The gripping start to the detective series in the icy latitudes of the Arctic tackles burning issues of immigration. Anna Fekete’s career as a detective begins in a northern Finnish coastal town. She is almost immediately thrust into a case that has grasped the nation. A young woman has been killed on a running trail, and a pendant depicting an Aztec god has been found in her possession. Another murder soon follows. Can Anna catch the Hummingbird before he – or she – strikes again? And at what personal cost? Anna is also troubled by the fate of a Kurdish girl, Bihar. Bihar contacts the police, fearing “honour violence”. But when the girl refuses to co-operate during questioning, Anna must look elsewhere for evidence. 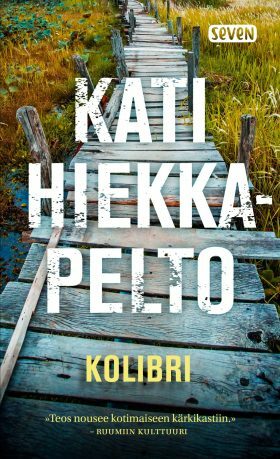 From our icy Arctic latitudes, the strong-willed/uncompromising author Kati Hiekkapelto and her charmingly young and edgy police officer, Anna Fekete, take Nordic noir in a new and fresh direction. These novels are a totally compelling read. All fans of Scandi crime will love this. Hiekkapelto knows how to get under your skin. Hiekkapelto is one of the most exciting new authors working in Nordic Noir. Here is an author who trounces the Swedes. Läckberg & Co. feel clunky once you’ve had a chance to devour the realistic, engrossing and vitally topical story about Anna Fekete.